Dee Lee Promotions, LLC. 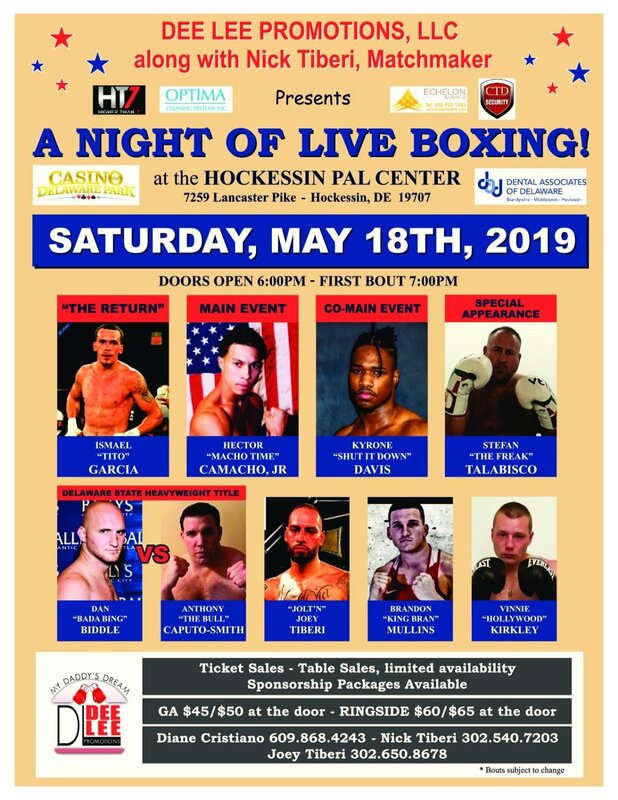 along with Nick Tiberi, Matchmaker presents “A NIGHT OF LIVE BOXING” at the Hockessin PAL Center in Hockessin, DE, Saturday, May 18, 2019. Hector “Macho Time” Camacho, Jr (58-7-1/32 ko’s) of San Jaun, Puerto Rico is set to headline Dee Lee’s latest top line professional fight card and Delaware fight fans are in for a treat. Victor Abreu (9-5-0/5 ko’s), Dominican Republic, has signed on to face Camacho, Jr. in an 8 round middleweight battle and both fighters have promised that one of them will see the canvas. Camacho, Jr. may be the son of a legend but, as his record will attest,66 bouts with 32 knockouts is hardly fighting in anyone’s shadow. The Co-main is another 8 round middleweight battle featuring Wilmington, DE, native Kyrone “Shut it Down” Davis (13-2-0/5 kos). Davis is coming off a heartbreaking hard fought decision loss to Patrick Day for the WBC Continental Americas Middleweight Title and would like this bout to be a new beginning in his continuing quest for a Title Belt. Two more 8 rounders on this card feature 3 fighters that are no strangers to Delaware. Ismael “Tito” Garcia (11-0-1/4 ko’s) of Vineland,NJ, showcased his many talents for Delaware fans when he headlined the March 30, 2019 fight card in this same ring. The last 8 rounder features Hockessin’s own Dan “Bada Bing” Biddle (9-7-0/5 ko’s) facing Kennett Square, PA, native Anthony “The Bull” Caputo-Smith (16-9-0/11 kos) for the honor of being crowned “The Delaware Heavyweight Champion”.These two men are no strangers and both vow to be the last man standing at the end of this one. Six 4 round bouts are scheduled to round out this 10 bout card. “Jolt’n” Joey Tiberi (17-3-0/9ko’s) leads the contingent. Joey is coming off 2 straight solid performances at the PAL and is definitely looking for his 18th win. David “One Two” Murray (8-2-1/6 ko’s) coming back for another win after winning against Antwaun Tayler in December. Stefan “The Freak” Talabisco (3-0-0/3ko’s), Vinnie “Hollywood” Kirkley (3-0-0/3 ko’s) and Brandon “King Bran” Mullin (4-0-0/2 kos) are all looking to extend their win streaks and provide a great night for their hometown fans. The last of those 4 rounders will be Delaware’s Ornella Sathoud making her Pro Debut and hope’s to bring her many supporters a win. Come out and support these young fighters! Doors open at 6:00 p.m., with the first bout slated for 7:00 p.m. Tickets prices are; General Admission $45 in advance ($50 at the door), Ringside $60 in advance ($65 at the door) For more info contact: Promoter Diane Fischer 609.868.4243, Matchmaker Nick Tiberi 302.540.7203 or Joey Tiberi 302-650-8678. Vineland, NJ – Diane Lee Fisher Cristiano, President and CEO of Dee Lee Promotions, LLC. is pleased to announce the signing of Middleweight Cleotis “Mookie” Pendarvis (21-5-2/9 ko’s) of Los Angeles, CA to a professional promotional contract. Pendarvis has fought for and won the WBF Intercontinental Welterweight Title and the USBA Super Lightweight Title twice in his career and Dee Lee Promotion’s hopes to guide him to another title fight or two in the very near future. Mookie, a southpaw, is just the kind of skilled fighter that other promoters avoid like the plague because as anyone in boxing knows, putting your fighter in with a skilled southpaw, is no blueprint for success’ and a real good way to get your guy beat. Cleotis has fought plenty of times in the other guys backyard and that accounts, in part, to his 5 losses. Fighting in places like Ontario, Guadalajara and Aguascalientes has more than its’ share of drawbacks and that’s before a fighter puts on the gloves. Both Dee Lee and Mookie are looking to avoid those same pitfalls this time around and with the very able assistance of Matchmaker, Nick Tiberi, hopes to see another title belt around his waist very soon.